The story of the Super Biton orchestra from Ségou has always been closely linked to that of the Biennales and its predecessor, the Semaines Nationales. The orchestra represented the Segou region in the category "orchestre moderne" at all the Semaines and Biennales (although a few times 'hors compétition'). I will come back to Biton's history in a later post. But at the very last of the old style Biennales in 1988 Super Biton disappointed and came nowhere near winning. Band members sought excuses and blaimed the lack of investment in equipment and instruments. The general opinion of the public attending the concert at the Cinéma Rex in Bamako was that Biton had exaggerated the flattery. Too much "Président Moussa Traoré is a great guy". 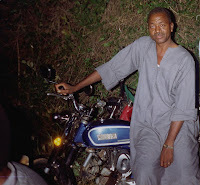 Personally I think it was the absence of Amadou 'Armstrong' Bah, who had retired as 'chef d'orchestre' after the European tour of 1987. He was the invariable quantity in the history of Biton. 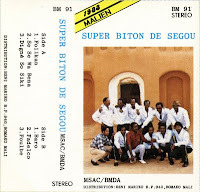 Biton released their last cassette (which they recorded in Abidjan) at the same Biennale. Although enjoyable, it's certainly not their best. EDIT April 12, 2015: The link has been updated. Not so epic than previous albums of the orchestra but very nice and fresh work of the "foli". Something has gone wrong with the link for this. I keep getting a 'page cannot be displayed" error. @Anonymous (Al): Thanks for letting me know! I've replace the link with a working one. Le load pointe sur une cassette de "Debonheur" (qui n'est pas mal mais j'étais vraiment très curieux d'écouter ce Biton que je ne connaissais pas). Merci beaucoup d'avance et bonne continuation. @Alain: Thank you for pointing this out to me! I have corrected it, and the link now leads to the Biton cassette. The Debonheur cassette is very nice too, by the way.